I have mentioned the mango tree behind our apartment in an earlier post. In reality, there are two of them, growing next to each other in the same compound. They belong to an elderly lady, of remarkable spirit and physical will, who lives alone in the old house within the compound. Neighbouring her plot is a house which has been extended several times and is occupied by several families. Among the many people in this strange house is a woman, K, who objects to the trees. She claims the leaves that the tree sheds ‘dirty’ her compound and cause her no end of trouble. Three days ago, she called the city municipal office and complained about the trees. They promptly sent a few men over to cut them down. Veena, a friend and neighbour, heard and saw branches falling and rushed out to talk sense into the municipal people and K. She begged and pleaded and even shed a few tears. The result was that the trees were spared, but all the branches extending over the compound were lopped off. The trees are now precariously balanced, with most of their weight on one side. When the rains come, I won’t be surprised if they just keel over and crash. The lady whose trees these are shut herself inside the house and refused to come out during the whole chopping up exercise. These are trees she has probably lived with all her life; they probably know each other as old friends do. She’s well over 60, perhaps close to 70 even, and each week, she diligently sweeps up the leaves from the trees and either buries them (during the rains, for compost) or burns them (during the dry season to heat water). Not all of us have the time and energy to maintain a garden, but I do wonder – to think of fallen leaves from a magnificent tree as garbage that ‘dirties’ one’s home, while being perfectly tolerant of the tons of un-reusable, un-recyclable plastic that we ourselves bring in daily, seems sadly warped, doesn’t it? This is a picture of the old house and the trees around it from last year’s monsoon. The lopped tree doesn’t look too bad from my balcony, as the cutting was mostly on the other side, but still I can’t bring myself to take a picture of it now. A fifty-six year old farmer. You live in Maguvinahalli, a village on the northern boundary of the famous Bandipur National Park. Yes, the elephants. They come from the forest, to feast on your precious crop. Last year, your brother Murthy lost everything in a single night to a herd of 9 elephants. It happened at the very end of the season, a few days before the harvest. He still owes the moneylender 14,000 rupees. Kttrrrrck! You are suddenly wide-awake, but it is too late. You fumble for the match and light a firecracker. The wick forms an arc of light, then bursts. Your hand is shaking as you throw another. It is louder than the last. One of the elephants lets out a cry. You can feel the earth shake under you. Overhead fly an early flock of parakeets. where your trousers really went. Yesterday, our neighbours smoked out a bee hive that had come up on one of their window shades. They had some pest control people hired for the purpose. 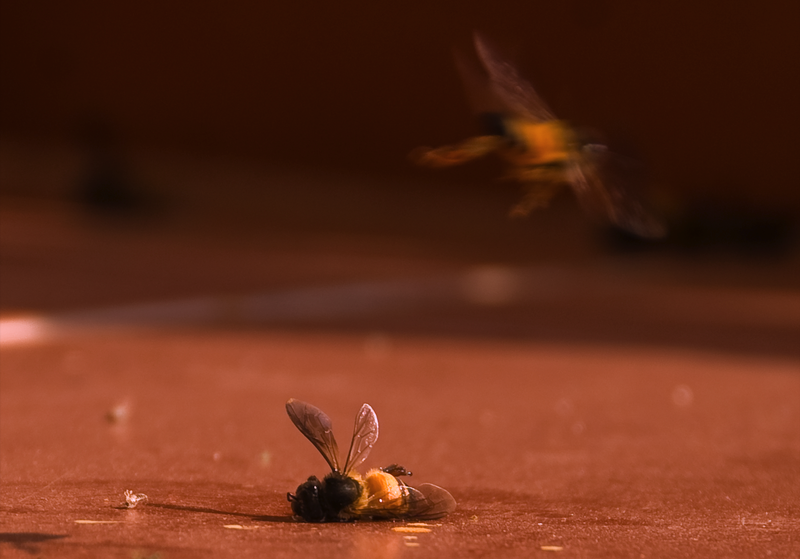 Kerosene was sprayed on the bees and then smoke of some sort used to drive the more persistent insects from the hive. 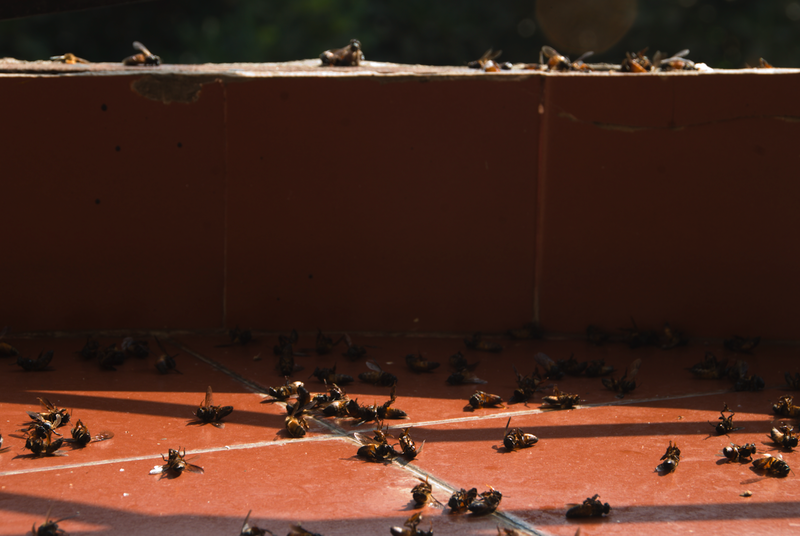 Within a few seconds of the operation, our balcony, which is located right below the hive, was covered with writhing bees. 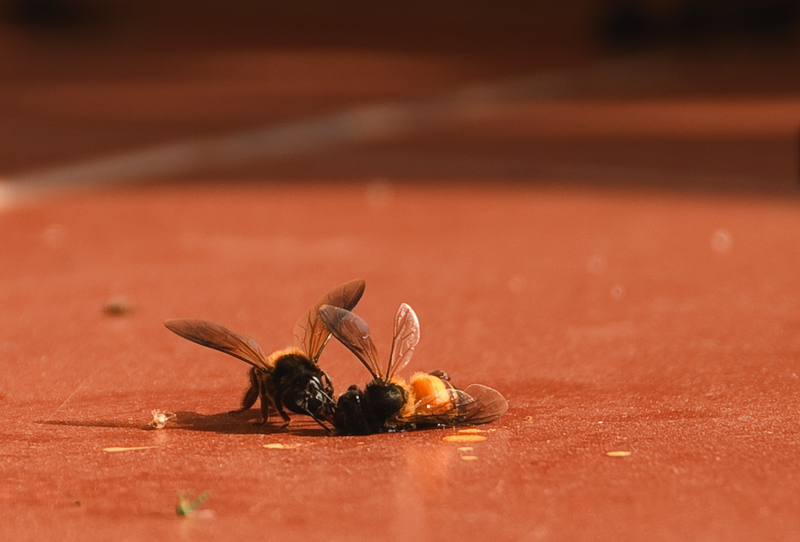 When they die, bees do a strange thing – they spit out honey. While thrashing about, they also manage to get stuck in their own sticky spit. Watching them do this fills me with a sort of horrified fascination – purging honey in their dying moments seems like a final renunciation of everything they have lived for. Almost as if they were saying: this honey is what defined me all this while. But I don’t need it where I am going. Stranger still was what I found this morning. 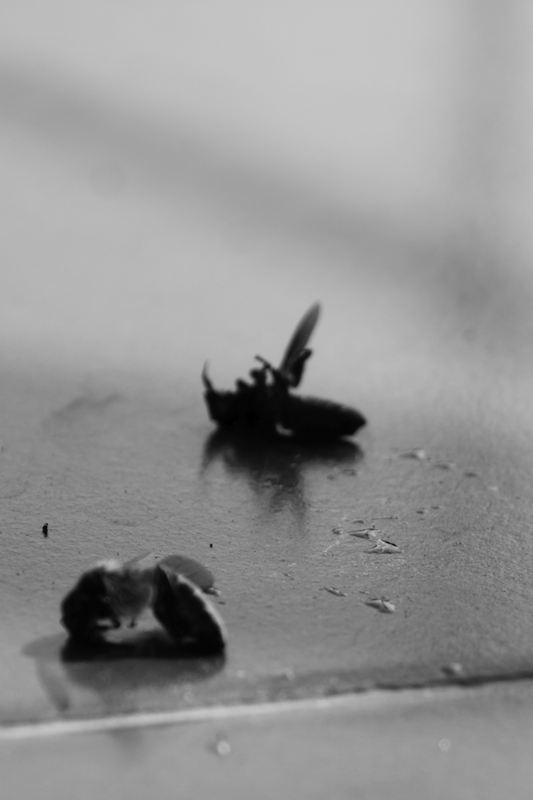 Bees that had managed to escape the kerosene were hovering around, flying from dead bee to dead bee. I wondered if this was an apian homage of some sort, but suddenly I saw what they were doing. They were collecting honey. Did this qualify as stealing from the departed? 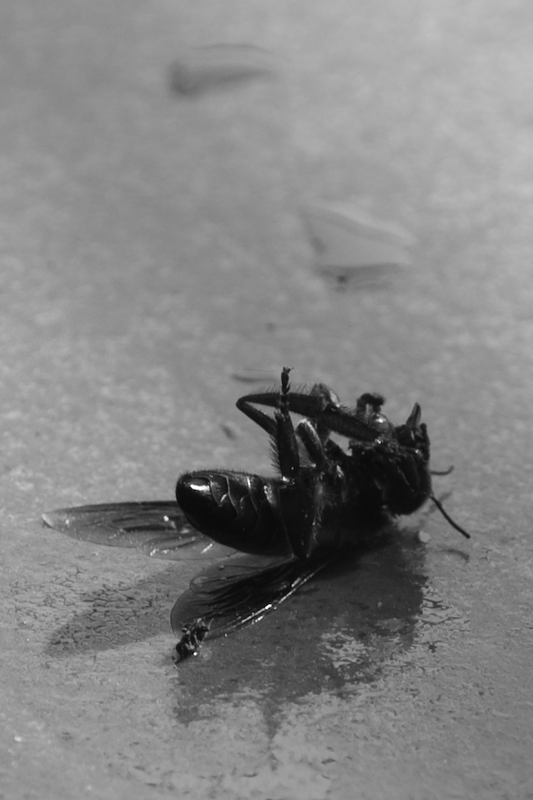 I think not – bees are unlikely to be weighed down by the same false morals we burden ourselves with. They were probably making the best of a bad thing. No more.